Springs are an integral part of your garage door. They provide the energy the door requires to be lifted up. The stronger the spring or more the springs attached, the more the energy they can generate. You will find a large number of springs on commercial garage doors. Springs, because they are such an important part of the garage door mechanism, tend to wear out early. Garage door springs have to be regularly tended to see if they are still functional. A broken spring can cause a garage door to stop working. It may even cause serious damage to your property and can be a safety hazard. When repairing a broken spring or replacing one, a large number of factors have to be considered by the repairmen, like if the spring should be tightened or if needs a replacement. Springs have a limited lifecycles before they need to be replaced. However, we encourage all our clients to contact us at Security Garage Doors instead of attempting DIY repairs. Springs have to be tuned properly and have to take heavy loads, so a badly-installed spring may end up causing a lot of damage. Torsion springs is an advanced version of the extension spring. 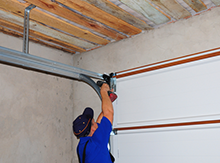 Many manufactures prefer to use torsion springs because they provide an extra layer of safety to the garage door. The torsion spring set up utilizes a combination of springs and cables. 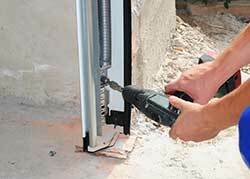 The spring transfers energy to the cables when the garage door has to be raised. If a spring ever breaks, the cables can still support the weight of the door. Torsion spring setups can be pretty complex. The tautness of the cables and the positioning of the spring(s) have to be just right to keep the system functioning properly. Our experts at Security Garage Doors have racked up a countless number of hours repairing or replacing torsion spring systems. Extension springs, on the other hand, provide less safety than torsion springs but are just as effective. You will often find extension springs being used in low cost setups. The mechanism involves a spring being stretched tight at both ends, and when the spring is made to snap back into place (when the door has to be raised); it generates a large amount of force. Extension springs have to be able to endure a large amount of pressure. They also need regular checks – an extension spring that is showing signs of snapping has to be replaced promptly or the garage door may come crashing down on your head. Residential garage doors don’t need more than a single torsion spring or extension spring, but it all depends on the size, dimensions and the weight of the door in question. Commercial garage doors with their multiple springs have to be maintained properly and services much more often than residential doors. Security Garage Doors provides a reliable maintenance and repair/replacement service for the varied needs of the citizens of the Alexandria, VA area.